Do you enjoy reading and feel passionate about promoting books that you believe in? Do you ever fantasize about the glamorous world of book publishing? Well, then Outskirts Press might be the ideal work-at-home (WAH) job for you! What Exactly is Outskirts Press? Outskirts Press is a full-service, online self-publishing and book marketing company for both aspiring and published authors. It was incorporated in 2003, and in 2007 The Denver Business Journal recognized the company for being the third fasting growing privately held company in Denver, Colorado. Outskirts Press offers first time authors or even seasoned authors the chance to promote their book in a variety of ways. Services such as ghostwriting, proofreading, book cover design, and marketing are all offered individually or in package deals. Books are usually in paperback form with POD (Print On Demand), but there also e-books versions available and books on CDs or e-reader versions offered (Kindle, Nook, etc.). One book could be in one or in many different formats or media. In the past, self-publishing usually took place at what was called a “vanity press” where authors were made to purchase a large inventory of finished books. However, with POD, a fresh copy of the book is printed only when someone orders it. This saves the self-publishing author from having to buy a large inventory of books as well as having to find the storage for the inventory. What Types of Jobs Are Available at Outskirts Press? While there is a variety of jobs at Outskirts Press, the most in-demand job seems to be the Publishing Consultant position. I knew someone who had started out in this position and then received a promotion to Personal Publishing Assistant. There is room for promotion as well. My friend absolutely loves Outskirts Press and has been there almost two years. There are also online chat agent jobs as well as writing jobs. There are e-book designers needed as well as editors and marketing professionals needed to promote the books. It is just a matter of sending in your resume and cover letter for the position that you are most interested. What Skills or Special Training is Needed? to convert leads into paying clients via phone and email sales support. to sell clients on additional services to help them improve their publications. to help clients navigate the initial portions of the pre-production process. to transition clients successfully to the production team. to seek potential new leads through independent, self-motivated marketing (cold calls, social media, etc.). It will be your marketing expertise that will determine if you will be hired. The better you are at e-mail marketing and social media marketing, the likelier you will be hired for the Publishing Consultant position. strong telephone and sales experience. great set of proactive customer care skills via both phone and email. keen combination of creative and critical thinking skills. dedicated set of project management skills. proficient computer and problem-solving skills. publishing and/or book marketing experience is a plus. Bilingual individuals with both English and Spanish language skills are a plus. Windows XP, Windows Vista or Windows 7 or 8 for an operating system. a reliable landline phone or the workable equivalent. a quiet and professional home-based office. 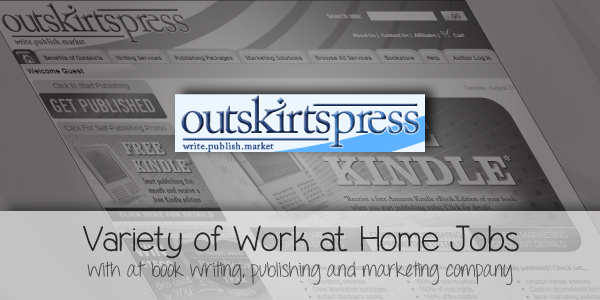 Are You an Independent Contractor or Employee at Outskirts Press? The publishing consultant position is an independent contractor position with task-based compensation, plus sales commissions and customer-service bonuses. Because you are an independent contractor, you will be responsible for your own taxes and will receive a 1099 Tax Form at the end of the year if you earn over $600 for the year. What is the Pay Like at Outskirts Press? While Outskirts Press does not post or advertise what it pays, it tends to be comparable with an entry-level marketing position (hourly equivalent) in a major corporation. Is the Publishing Consultant Position Limited to Authors Only in a Demographic Region or by Genre? While you aren’t limited to a certain demographic region or by genre, it does help to limit yourself and your marketing efforts by specializing–as most professionals do–in a niche market. How Can Someone Apply to Outskirts Press? If you are interested in applying to Outskirts Press, email your resume with a professional cover letter to hr@outskirtspress.com. You may mention the Publishing Consultant position, ghostwriting position or even the chat agent position. If Outskirts Press is interested in you, you will be contacted by email for a telephone interview. The interview process can be a difficult one, so be prepared to do quick thinking as you are given marketing scenarios. Even though I did not give an opinion, I do think that this appears to be a great place to work.